Decorating the skin with ink designs is an ancient human custom; Ötzi the Iceman, dug out of the Alps in 1991, had over 50 tattoos covering his body. However, the modern era of dermal art began in America. Tattooing was electrified in 1891 by modifying Thomas Edison’s electric engraving pen, but it remained a glorified sewing machine for about a century, piercing the skin at 80 to 150 times a second to drive ink into the skin. Once the province of sailors, criminals and the Maori, Western counterculture has embraced the custom and brought it up to date. In the last generation, breakthroughs in technology have changed the possibilities of inking, introducing liquid crystal designs that are animated, glow-in-the-dark images visible only under a blacklight, and ink that can be erased by electromagnetic rays. 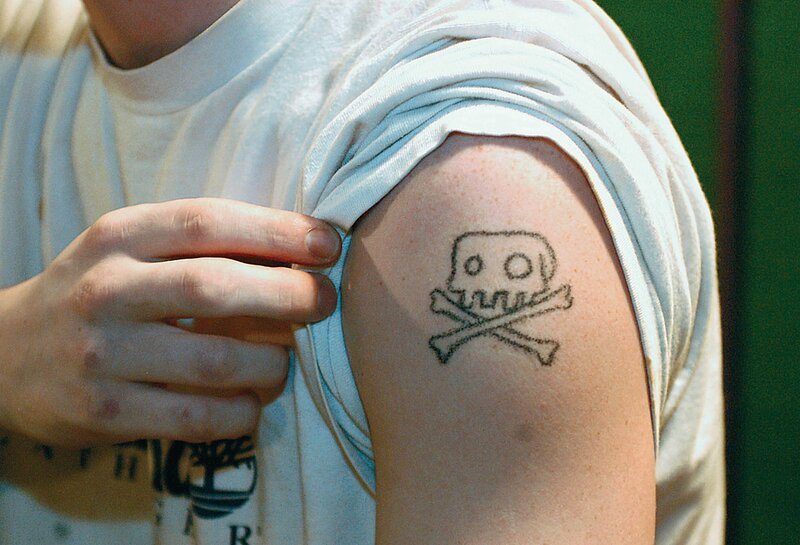 At the same time, in the hipper corners of the Western world, a fad in the use of the most rudimentary method possible, “stick and poke,” has left a lot of cutting-edge types with primitive, handmade tattoos not too different from Ötzi’s. Kits are available on the Internet for about 40 bucks. Nothing new to me; I’ve seen both the process and the shaky results before. But never outside of a prison. There, where people have a lot of time to master their craft, men build tattoo guns out of anything with a motor. For this reason, all VCRs are locked in cages, and even broken cassette decks are required to be turned in, although by then the motor has been removed and replaced with something similar in weight. But in county jails, the “stick and poke” method is common; I’ve played the lookout for dozens of rushed, bloody jobs done with a sewing needle, thread and an approximation of ink. Each artist has his own recipe, but the common denominator is carbon. A chess piece or other plastic is burned under a piece of cardboard and the black soot scraped off, to be mixed with a proprietary blend that usually includes shampoo and saliva. The results are what you might expect: lines that aren’t straight, letters that blur, infections for all. But they are definitely permanent. The kit is presented as an artifact from ye olde golden age; the careful packaging compensates for the paucity of contents: two needles, some ink and a lot of gauze. The very paper the instructions come on appears hand-cut and block printed. 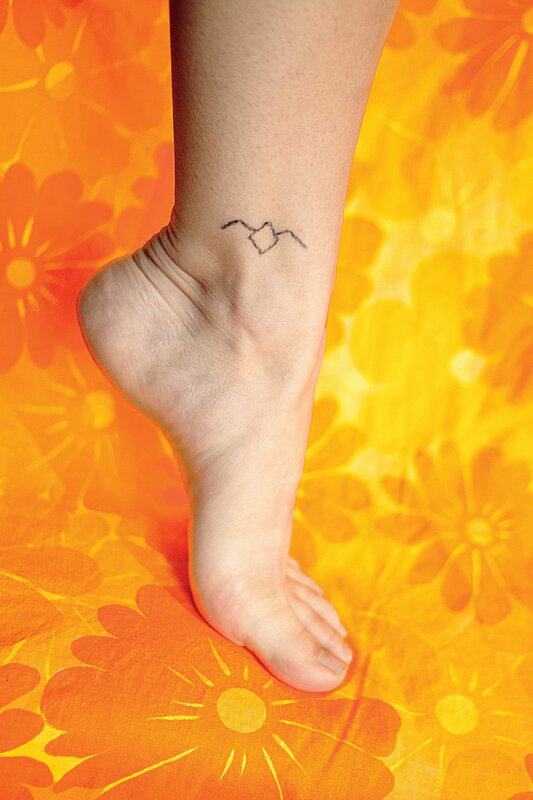 The recommended designs (which have to be simple) are retro anchors and hearts, and the fact that the ink is guaranteed to be vegan is important to many buyers. Typically, the clients are not locked up in some juvenile detention facility; most are college-educated, though the fact that they are getting a prison-style tattoo is appealing to them. They are the hip. Stick and poke tattoos are an expression of irony. Prisoners love tattoos, so when I was processed into my first joint and confessed to not having any, the guards stripped me down because they assumed I was lying. Less than two years of heroin addiction had taken me from my desk at a literary agency to amateur robbery with a pocketknife. Back in 2003, the newspapers called me “the apologetic bandit” because of my obvious regret for muggery, but the judge sentenced me to 10 years nevertheless. My untattooed skin was but one example of the myriad ways I was out of place in the 12 prisons I served time in during my decade inside. Some prisoners are inked because their gang requires it, while others cultivate a tougher image with skulls, dragons and daggers. But at a more individual and touchingly human level, prisoners defy the confiscation of their humanity with body modification. They resist becoming a warehoused thing rather than a man and tattoo themselves, even though it is against prison regulations and punished severely. Men use ink to fight the loss of personhood that is an intrinsic part of incarceration. Being processed into prison—a long and tortuous procedure—systematically strips one of outward marks of identity. First your clothes are taken away and replaced with a uniform. Then your hair is shaved off. Finally, you are given your number, and that is what you are reduced to: your number and your body, and you can’t change your number. Bodybuilding and tattooing, even primitive piercing, are small rebellions against this assault on identity, sans any irony whatsoever. Although modern tattooing was basically invented in New York’s Bowery, the process was illegal in New York City from 1961 to 1997. Fun City Tattoos, on St. Mark’s Place, was established in 1976, which means that it operated quasi-legally for two decades. There was a phone booth outside that a potential customer called from; once vetted, he passed through the coffee shop to meet his artist in the back. These days you can just come in and ask Melissa Garcia about do-it-yourself kits. “With the legalization of tattoo parlors in 1997, marking yourself with a stick and poke kit is just stupid,” she says. “Doing something like this to be cool is the opposite of authentic. In fact, it’s pretentious.” It’s a common argument made against hipster subculture. Is drinking Pabst Blue Ribbon when one can afford better also pretentious? Or choosing to wear thick nerd glasses instead of light and elegant frames? Not when done in the cause of irony. Of course, with a DIY tattoo, the irony is permanent. Stick and poke is an inaccurate science. Years ago, I was the lookout on a sewing-needle-and-thread job being done in the Greenhaven Correctional Facility yard in upstate New York. The “artist,” Tattoo Bob, was a butcher who would tattoo anything on anybody for money; he had an expensive drug habit and two life sentences. A Bloods gang member was getting a letter put on the back of his neck, and Bob was rushing the job, scared of getting caught. The consequence would have been a year in solitary; he was doing the job for two packs of cigarettes. The young gangbanger asked me how it looked. I told him it was fantastic, but he must have noticed the hesitation in my voice because he asked me which letter it was. For the life of me I could not tell. Luckily, Bob managed to mouth “G” in time, allowing me to lie and leaving the guy happy, at least until his friends told him the truth. My wife and I tried the kit, despite an inner voice telling me not to—in Yiddish cadences. Many cultures of the world have used tattoos as symbols of religious significance, their permanence full of mystical meaning. However, Jews abhor them along with other forms of body modification. The Orthodox Jews believe God wants his chosen’s bodies unadorned, and for centuries a person like myself, disfigured with ink, could not have been buried in a Jewish cemetery. That prohibition had to be altered in 1945, because of concentration camp survivors with German numbers on their arms. Today’s self-tattooed Jews are the beneficiaries of this grim turn of history. Culturally, the atmosphere has changed as well. 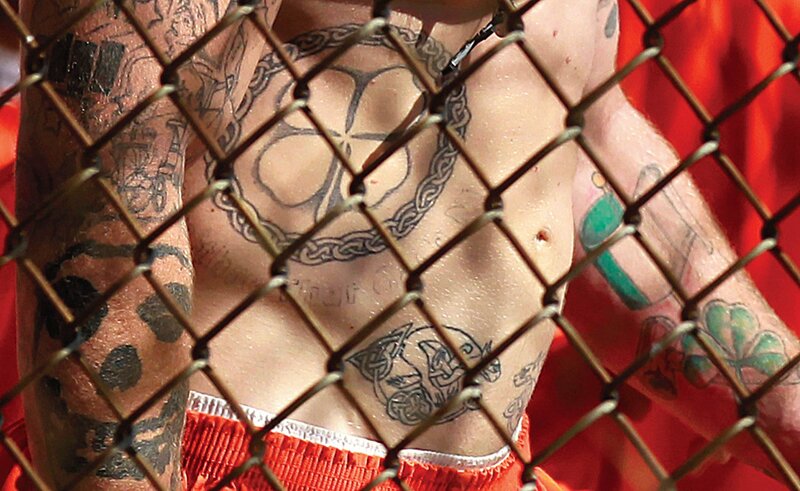 In modern, Western life, tattoos have become accepted as a form of self-expression and are no longer associated with criminality or the low life. If tattoos are no longer rebellious, maybe bad tattoos can be. Colby Beck sent me a picture of his homemade tattoo, and an explanation of why he’d done it: “Tattooing myself by stick and poke method was necessary. It wasn't about spending money on a well-known artist or the quality of the work, it was about rising above how I saw myself in the world. For so long I had judged myself by what I thought other people thought of me. I know it sounds crazy, but it’s true. When I finally stopped putting others before myself, I realized I could wear whatever tattoo I wanted and who better to ink it than me? I just dig how these people can most likely afford to go to the local shop but choose the DIY method for authenticity or street cred. I’m also talking about myself.” The result, a shaky heart with “Becky” in it, could easily have been done on Rikers Island. The stick and pokers, with their vegan ink and DIY ethos, probably realize they are walking around with what might be mistaken for prison work. They might even savor that. Inflicting a homemade tattoo on oneself is about the authenticity. Apparently, it is also liberating to people like Beck. Meanwhile, the pros just find it pretentious. But with the invisible Internet swirling all around us in the ether, a landscape of avatars and digitized existence, a bit of primitivism that includes pain and blood just might be the reminder a man needs that he is human. And not your everyday version either; the special kind of self-aware and daring homo sapiens who jabs ink into his epidermis with a needle. He’s not looking for beauty; that can be bought. He is self-applying authenticity. Permanently. And now, after having resisted many an opportunity, I have joined the legions of the tattooed. 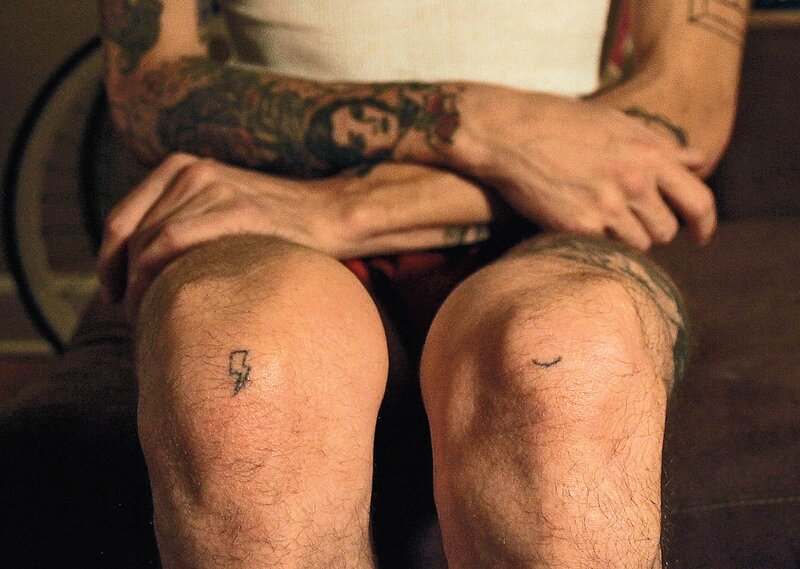 Twenty years ago, my living room in Manhattan’s Lower East Side hosted “tattoo parties,” where punk rockers disfigured each other. I resisted the urge then. During my decade in prison, I said no even when my Taschen album of Hieronymus Bosch prints was used as a model for others. But the other night, with my wife wielding the needle, I finally accepted the ink and returned the compliment. We now have matching dots on our feet. They are small and barely visible unless you know the story behind them, but a private ritual passed between us. When we show our dots off, we’re ironic sophisticates, but in fact the tongues in our cheeks are the pose. We now share something that cannot, unlike a wedding band, go down the drain. The irony melts away, and the caveman and his mate appear. Ötzi the Iceman’s 50 tattoos all meant something to him, although we will never know what. The gangbanger’s blurry letter on his neck also had significance, though I never learned what the G stood for. The matching dots on the left feet of my wife and mine have meaning as well, and we know exactly what it is. Under the needle, the veneer of civilization crumbles and man emerges, whether he is sticking himself in a prison yard or gritting his teeth while his wife wields a needle. Without chasing authenticity, we achieved it. Perhaps that is the perfect way. We didn’t try too hard, and it didn’t hurt that much.